A modern classic beach house embodying the charm and spirit of Sullivan’s Island, in a true deep water locale. catching fresh breezes from the Atlantic. Third-floor roof garden with wet bar, accessed via indoor stairwell through cupola. expansive porches, decks & roof garden/terrace. In true ourbeachhome style, everything done to perfection, down to the smallest detail. All the amenities you would expect...granite, custom cabinets, “instant” circulating hot water throughout. Dual master suite options - upstairs, complete with gas fireplace, private deck, his & her dressing/closet areas, whirlpool Garden tub & separate ceramic tile shower. Downstairs master suite provides option for one-level living. 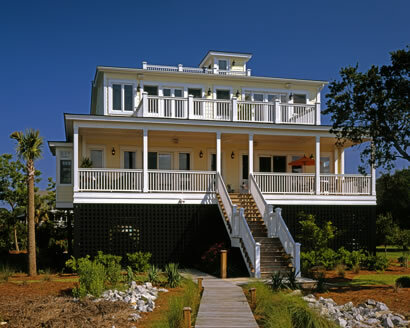 ourbeachhome … providing you the ultimate Lowcountry living experience.